So this week I decided it was time to just bite the bullet and buy myself a new camera body! I love the lenses I use (Sigma 30mm f/1.4 and 17-70mm f/2.8-something) but I felt like it was time for a body upgrade. The body I was using, a d40, has been discontinued for awhile now and I’ve been ogling a new one for the last few months! I got a Nikon d5000. This is definitely a fair upgrade – double the megapixels, Live View, takes HD video, great sensor, but still in a more compact body than the spendy-but-awesome d90. There were a few things that made me choose the d5000 over the d90. Price was a big one, the d5000 being more than a couple hundred dollars cheaper. I’m used to the display of the d40 and the d5000 is quite similar, and the size and shape are similar as well. The d5000 is a touch bigger than my old camera, but not as big as the d90. Since I have teeny tiny hands that’s important to me! (Although of course if someone wanted to sell me a d90 for the same price or something I certainly wouldn’t refuse). The d5000 also has an interval timer, meaning you can take more than one timed shot at a time. The LCD screen hinges from the bottom. Which is great if you want to say, use the live view and the LCD to hold the camera up high and still see what the camera sees. But it’s going to be useless for my self portraits. Can you see why? Yup, it won’t play with a tripod. You can’t put the camera down on something and still see the screen. This was a pretty poor choice on the part of Nikon – the screen should have hinged from the side, making it available at pretty much all times. This colour, Madelinetosh’s Composition Book Grey, was pretty tricky for my old camera. With the new one, presto! 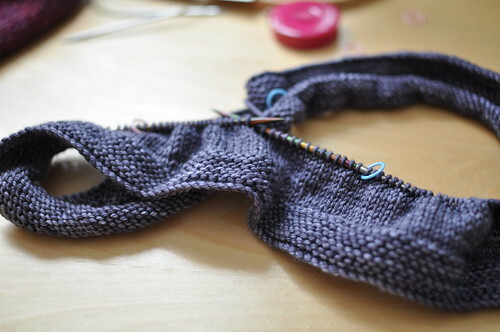 I’m trying to get this sweater done in time for Rhinebeck – the sleeves are done, but I keep having to restart the body. Even just now I looked down at it and realized I should’ve done more hem shaping. Once I think of something like that, I can’t just let it pass, so I guess I’m ripping yet again! 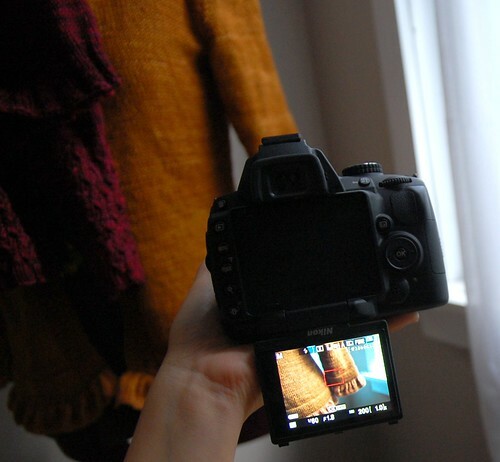 So much to consider when purchasing a camera! Your d5000 sounds pretty good–and the colors *are* incredible! There’s nothing like getting a camera upgrade! I recently upgraded from the D50 to the D90 (got lucky with an insurance claim!) and, wow, what a difference! The D5000 is a gem of a camera, I look forward to seeing your new photos. Love the Madelinetosh grey and how it’s captured. It looks almost “velvetish”. 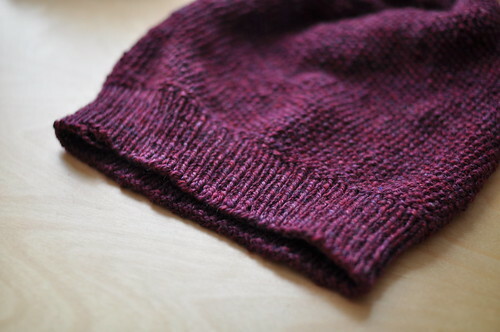 It is a good investment for you since tempting us with your great knitted patterns is part of your job! It must be nice to be able to easily capture the true colors. This is something I cannot always do with my camera… Cheers! Good for you lady. Your pictures look great, but they always do. The D5000 was in the running when I was looking for a camera this summer. I went with the Olympus E-PL1. I agree with you about the hindge on the bottom, in that it should be on the side. At the time, I didn’t even think of an articulating screen, now I yearn for one! It will definitely be on my shopping list for my next camera. I absolutely love the Madelinetosh’s Composition Book Grey yarn. Your new camera captured it perfectly. Gorgeous photos! I want to go to Rhinebeck, but it is not in the cards for this year! Ahhhh, so much to consider for a new camera! I need to learn the anatomy on my. I just tinker around and cross my fingers that the pictures look good and true to life. Your pictures look awesome! I’ve got mine d3000 and still learning how to use it. Cheers! Curious. Can you AF with the Sigma lenses when using your Nikon cameras?